Do you want to get rid of a scrap vehicle for top cash for cars in Perth? Is it too old, crashed, broken and worn-out that it is not-worth repairing? It will be undoubtedly a very difficult task for you. But with experienced the help of experienced auto wrecking experts this process won’t be as troublesome as it can be. If you like in Perth, Western Australia, choosing qualified and certified Perth Auto Wreckers, will be a great choice. We are well-known for buying, wrecking, dismantling and disposing of various types of automobiles, particularly damaged, unregistered and not-roadworthy. This way, we give an amazing chance to sell unwanted vehicles for best cash while skipping the related hassles. We can give you a stress-less and free car removal service with top cash in just one day. If you wish to find out the right value of your vehicle, just give a call at: 08 9452 8859. When you have an old jalopy consuming your garage for a long time. It seems impossible to sell it for money, especially when you desperately want to sell to make space for a newer vehicle. If you really want to get maximum money while spending less energy and time, contact us. Because you will be able to make instant dollars while getting your old clunker remove in just 24 hours or so. You don’t have to waste money and energy on things like paid ads and haggling with private buyers. We use the best skills to assess automobiles condition even if it is irreparably broken or in a poor shape. As we also consider the amount of recyclable parts and materials in an automobile to assess fair value. Therefore, you can completely rest assured to get an accurate cash quote that is unbeatable. Many times we deal with customers who are initially afraid to sell their old rides because of the bad condition. But we always give 100% guarantee to accept an unwanted vehicle as it is. We are never concerned if it operates perfectly or damaged beyond repair. We buy automobiles for the purpose of salvaging and recycling its parts, which are sold as refurbished items. It is because of this that we are able to pay generous cash for various varieties of models and brands. If you try to do this at home, it will be a really troublesome activity. So, it is best to hire our professional and pain-free car wrecking services. Why Removing Unwanted Cars are Important? There are plenty of reasons which may compel you to sell your old car. But if you want the best price, make sure to contact none other than “Perthautowreckers”. We will evaluate it using extensive knowledge that we have earned over 25 years of service in this industry. Vehicle is damaged and you don’t want to waste a large sum of money to repair it. The car is damaged and broken to a level that it is completely pointless to fix it. You want to sell it to meet your urgent need of quick cash. You want to sell it off as is ASAP because you are moving abroad. It lacks quality safety features and you want to upgrade it. Its fuel consumption is increasing day by day. Remember, we will happily purchase your car for top cash regardless of the condition. You can most often come across auto wrecking companies which accept only a few makes and models. However, we are not at all selective when it comes to buying a particular make and model. We clearly like to remove and wreck nearly all brands to avoid giving any unnecessary trouble to our customers. You have full access to our first-rank and reliable service whether you are looking to sell: Nissan, Toyota, Chrysler, Volkswagen, Mazda, Holden, Mitsubishi, KIA, Hyundai, Chevrolet, Audi, BMW, Mercedes, Ford, Holden, Isuzu, Skoda, Lexus, Honda, Hyundai, Volvo, SsangYong, and rest of the popular brands. Selling a car for top dollars is not just the only reason you must contact us. You can also connect with us to earn a great price for Ute, SUV, 4wd, van, truck, bus or motorbike. Basically, you have to just call us and name your vehicle and we will come instantly to pick it for free. We remove car bodies and can buy your car for parts as well. Your identification proof – a copy of passport or driving license. Title of the vehicle or documents of registration (Don’t Worry, if you have lost it). Car key (Please make sure to let us know if it is missing). If you have a busy schedule and you want to desperately get rid of your old vehicle. You will be happy to learn that we offer free removals that are available 24 hours of a week. You can just let us know where we have to come to pick up your wheels and our professionals will be there on time. Our Car Wreckers use best quality equipment and towing vehicles to remove automobiles in the safest possible way. And, the best reason to use our service is that you can make highest money in just one day. You will receive it in cash before we leave with your junk vehicle. We can reach you anywhere in Western Australia including Perth, Maddington, Cockburn, Armadale, Malaga, Joondalup 6027, Mandurah, Rockingham, Belmont, Welshpool and Kwinana WA. Additionally, there is no need to take the headache about arranging the required documents. As our friendly and experienced team can take care of all the paperwork for your vehicle. Isn’t this great? 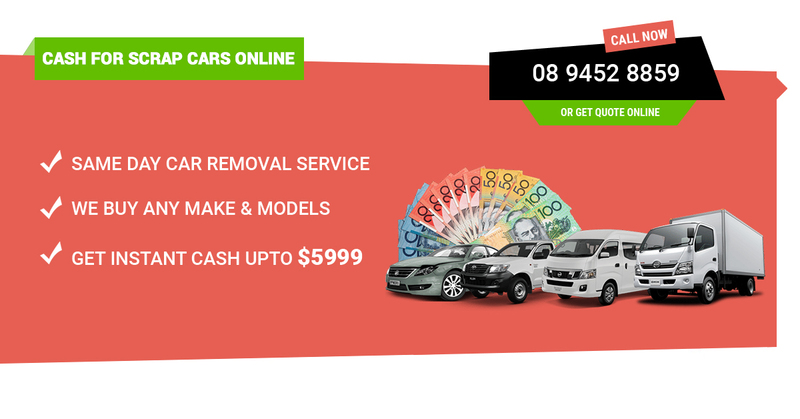 You get top cash for cars removal in Perth, WA and instant cash on the same day. So, why not contact Perth’s number one Cash for Cars Perth Service today to book an appointment? Quickly visit our website and fill out the quote form (called, Get a Quote) or dial our phone number: 08 9452 8859. We will give you a quick response with most precise and fair price offer.